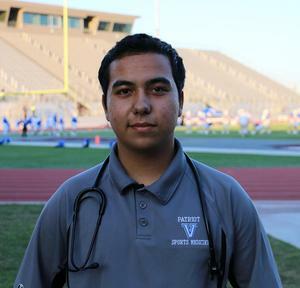 A student at Veterans Memorial High School (VMHS) has combined what he he loves, with the support of campus and district staff in addition to educational programs; and mixed that with some determination and extra effort to attain a national professional certification no other Mission Consolidated Independent School District (CISD) student has done before. Mission, Texas- A student at Veterans Memorial High School (VMHS) has combined what he loves, with the support of campus and district staff in addition to educational programs; and mixed that with some determination and extra effort to attain a national professional certification no other Mission Consolidated Independent School District (CISD) student has done before. VMHS senior, Alexis Aranda has officially received his certification as an Emergency Medical Technician (EMT) from the National Registry of Emergency Medical Technicians. The determination and extra effort for the certification came over this past summer, when Aranda was able to complete the EMT training courses at South Texas College (STC). This consisted of 16 hours of college credit course work. After successful completion of the courses came the certification exam. Aranda says he hopes to attend The University of Texas-Rio Grande Valley for nursing school, and then use the Bachelors Degree in nursing to apply for medical school. As for his work with the Mission Fire Department, he said he plans to keep serving as a volunteer firefighter as it allows for schedule flexibility. 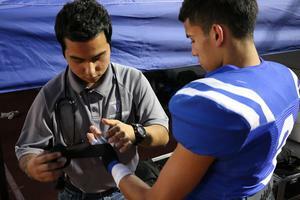 Pictured is Alexis Aranda in the role of a student athletic trainer, attending to a football player before the start of a recent game.